On Wednesday, March 2, 2011, at 0300 hrs. Phoenix Police officers responded to a call of what ultimately turned out to be a home invasion involving multiple armed suspects at 88 Av. and Monterosa St. Later that same morning Chief Jack Harris took the opportunity to address the media. During this press conference Chief Harris made several statements that raise concerns. This statement raises several questions, Who are the groups and people the Chief is referring to? Could it be Sgt. Phil Roberts who sounded the alarm on flawed data well over a year ago? Could it be PLEA that actually obtained copies of almost all of the reports, read them, and discovered that only about one in four of the DR’s could actually be tied to border related violence as specified by the federal grant applications as well as sworn testimony? PLEA has never attempted to minimize the threat posed to officers and citizens by border related home invasions and kidnappings and was sounding the alarm about this issue after the West Cypress home invasion incident that occurred in June of 2008. It was also PLEA that was and has been pushing the issue of private purchase rifles for patrol officers. For the Chief to insinuate that certain “groups” are trying to say there isn’t a problem is ludicrous. Does the term “bean counter statistics” refer to the federal authorities who are presently reviewing all of the data or does it refer to employees working within the police department’s own Crime Analysis Research Unit (CARU)? PLEA recalls a case from several years ago when an officer testified under oath at a trial that they had made about 100 drug arrests. Due to the fact that the officer only had about a year on, the defense attorney questioned this number and was ultimately able to impeach the officer on the stand due to the fact that the actual number of arrests was much lower. The Phoenix Police department ultimately fired the officer over the issue [as they should have] on the basis of integrity. When officers fudge the numbers they are terminated, shouldn’t the same apply for managers that engage in the same conduct? Does this mean if federal authorities ultimately determine that some type of fraud or perjury was committed in the filing of the federal grant applications that the end justifies the means and that the Chief would do it “again, and again, and again”? The Chief is obviously aware that he is an at will employee that serves at the pleasure of the City Manager. Is the Chief through his comments threatening the City Manager who is his immediate supervisor and more importantly the citizens of Phoenix who are the real boss? In the world that the rank and file street officer lives in, a statement of this nature is called insubordination/defiance. Officers Mislabeling Reports: Chief Harris is quick to lay blame at the feet of junior patrol officers for mislabeling DRs. Nothing could be further from the truth. Police officers regardless of experience are capable and competent enough to assign the proper title to a police report. First line police supervisors are certainly competent enough to review these reports to double check the titles and contents. The argument of mislabeled reports is nothing but a smokescreen to shift the blame from those in police mangement who took it upon themselves to reclassify reports that were not border related kidnappings into the kidnap category to make the numbers fit. 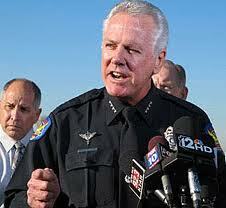 On Thursday, March 3, 2011, at 1430 hours, City Manager David Cavazos convened a press conference at the Phoenix City Hall building to announce that he was re-assigning Chief Harris to oversee other public safety functions and Executive Assistant Police Chief Joe Yahner was appointed interim Police Chief assigned to control all police operations and required to report directly to Asst. City Manager Ed Zuercher. CLICK HERE to read the March 3, 2011 news report from AZ Republic columnist Laurie Roberts on the topic of the recently announced reassignment of Phoenix Police Chief Jack Harris.